Located in the heart of Thamel in Kathmandu city Hotel Yala Peak is within walking distance to many popular tourists sites, facilities and services. 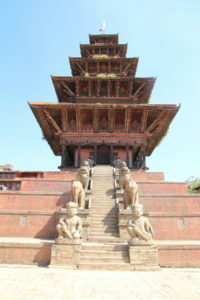 Kathmandu Historic Heritage sites only 5 minutes away! 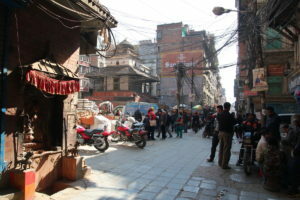 Take a left out of our street and within 5 minutes walking you will be in Thahiti Chowk, the start of old Kathmandu. Filled with old markets, stupas and temples it’s only another 3 minutes to the tranquil Kathesimbhu Stupa. Old Kathmandu City is only 3 minutes walk from our doorstep! Another few minutes walk and you’ll arrive at the old heritage street of Itum Bhal filled with ancient spice markets, monasteries and hidden treasures. Further along again by only 3 minutes and you’ll be in Indra Chowk where a mighty statue of Indra sits inside a temple. Do be sure to ask our staff for a free map! 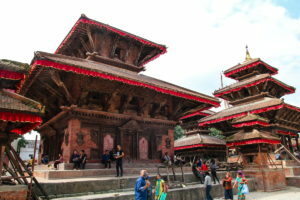 5 minutes walk later and you’ll be in the center point attraction of Kathmandu Durbar Square! Simple step out of our quite little street and you’ll be in the center of the popular tourist sector of Thamel. Filled with restaurants, cafes, coffee shops and heaps of souvenir stalls. If you need to take a break then come back to the quiet balconies of Yala Peak Hotel or our lounge area to relax with some refreshments. The ever popular Monkey temple is about a 10 minute taxi ride from Hotel Yala Peak. Or a quite 45 minute walk. We recommend a taxi as there’s quite a lot to explore in Swayambunath with many steps to hike up. We offer non-commissioned taxis from Hotel Yala Peak so feel free to book with us with no hassles. Taking a taxi out to the huge Boudhanath Stupa can be done right from Hotel Yala Peak. If you leave early you can also fit in Pashupatinath during the same morning. You have several choice to make your way to these two ancient royal cities. Our staff will show you a shortcut from our hotel which will take you to the main bus park where you can catch a bus. Alternatively you can avail of our commission-free taxi to make the respective 20 minute or 40 minute journeys. Hotel Yala Peak is located only 9 minutes walking distance from Kantipath tourist bus stop where morning buses will take you to the popular destination of Pokhara or Chitwan. We also offer the best rates in pre-booked bus tickets to save you time and make your trip more enjoyable. Hotel Yala Peak is located less than thirty minutes from Kathmandu International Airport. We can offer you a pre-paid taxi no matter what time of the day or night you need to be at the airport. Our staff can also help you with any flight ticket inquires you might have. 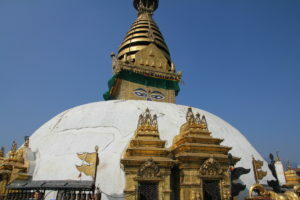 Where ever you plan to visit in Nepal please take advantage of our free travel desk for advice. We want you to enjoy your stay with us and to come back to us again.